Can Biting Fur Be Psychological in Cats? Stressed cats sometimes bite their fur or groom themselves excessively. You've seen your cat bite himself before, but never like this. After a vet's ruled out the usual suspects -- allergies, mites, fleas, etc. -- consider possible psychological causes. Believe or not, cats get stressed. Routine tweaks might help, but your cat may need a behaviorist or anti-anxiety medication. Does it seem like your cat is biting himself an awful lot? And that constant licking -- that can't be normal, right? Most cats spend several hours a day cleaning themselves, but there's such a thing as excessive grooming. It leads to irritated skin, biting and even hair loss. If it seems like your cat is biting himself every time you look at him, it's time to schedule a vet appointment. Once you've ruled out physiological causes like allergies, mites and fleas, it's time to address psychological possibilities. Your first order of business is to assess your cat's mental health. Between all those naps and that eating, it might seem like your cat is hedonism personified. Cats psychology is more complicated than that, though. Cats are creatures of habit. They thrive on regular feeding times and familiar company. At the same time, they need stimuli that appeal to their natural hunting and territorial instincts -- things like toys and scratching points. Balancing these needs is rough, especially for indoor cats. Given an imbalance, cats get stressed, anxious, bored, lonely or even afraid and nervous. This leads to obsessive grooming -- the phrase "licking your wounds" isn't always used literally, but it's got some behavioral basis -- and biting. Have you changed anything around the house recently? 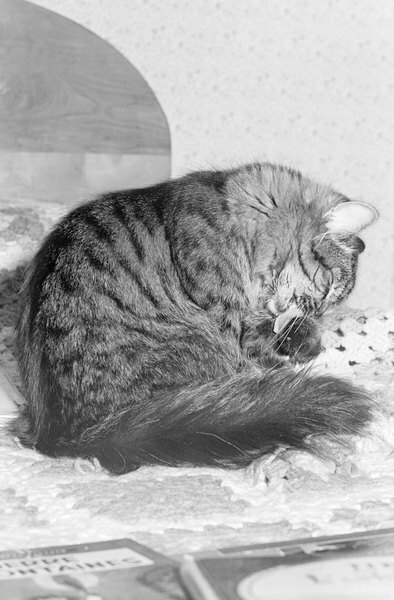 Moving or cleaning your cat's favorite bed can cause stress. So can changing cat foods, feeding times or litter type. Make changes to your cat's habitat or routine gradually. Mix new food with old food and move furniture in stages. Does your cat have enough stimulation? You need to encourage appropriate scratching via cat trees or cardboard. A few toys might help. Get involved in play -- it's good for bonding and your cat's mental health. It's tempting to get another cat if your cat's lost a playmate. It could help, but it could also heighten tensions. Ask your vet how to introduce new cats. So, you've exhausted the medical possibilities, made sure your cat's has a steady routine and enough stimuli, but he's still biting his fur. Ask your veterinarian about using anti-anxiety medication as a stopgap. Commercial sprays may help, too. There may be no immediate solution. Some conditions that cause biting -- hyperesthesia syndrome is one of the more serious, high-profile ones -- come and go, seemingly at random. Be patient and supportive. If you're scrutinizing your cat's every move, you can add to his stress, too. Allow him retreats and safe spaces. Fur biting may be a lifelong issue. Can Cats Sprain Their Ankles? Can Cat Litter Make Cats Cough?